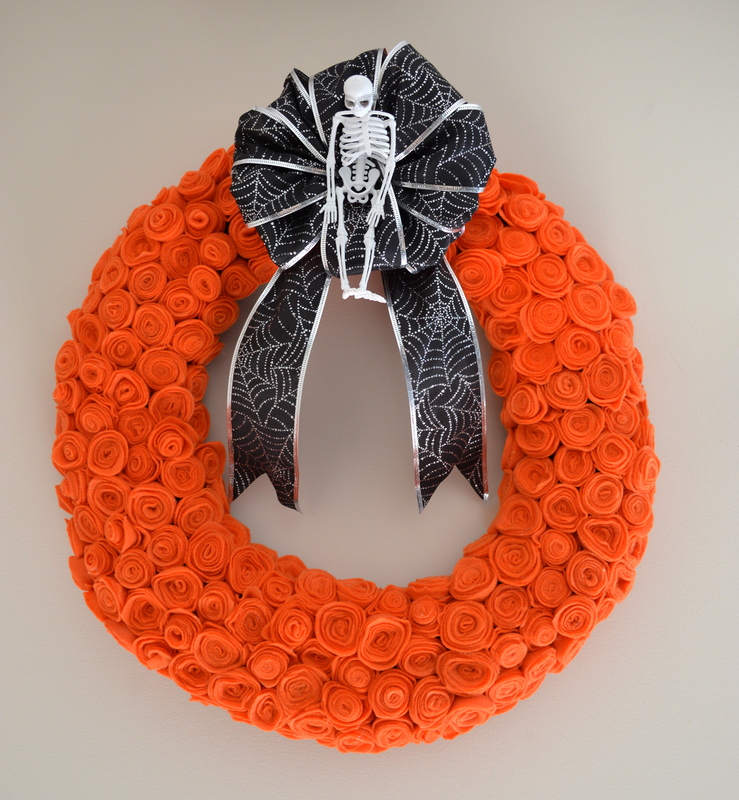 Decorating for Halloween + Giveaway Winner! 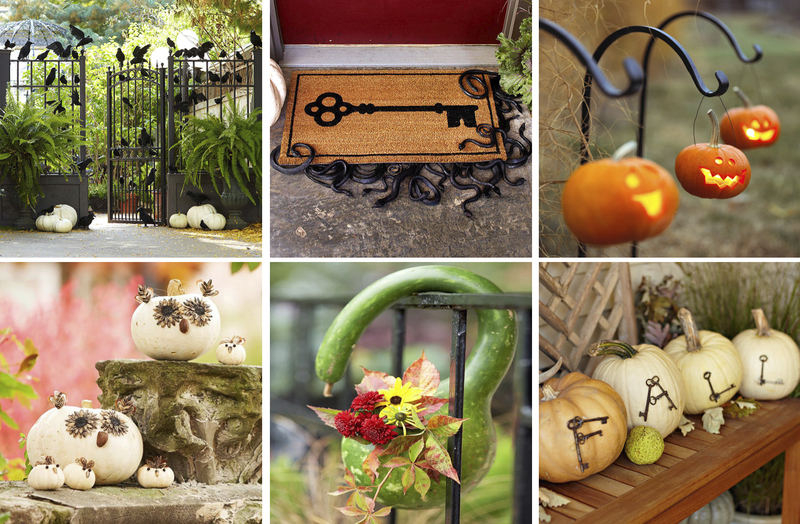 As October is cruising along, I’m sure a lot of you are looking for some inspiration for your Halloween decorations! I thought a fun home tip post would be to share some things that have caught my eye and really impressed me! I’ll give you some ideas for the outside of your home, the inside of your home, your tables and even some fun food ideas! I’ll also link to some of my decor and crafts from the past couple of years for even more inspiration! Also, a big thanks to everyone who entered the Two Year Blogiversary Giveaway which ended Sunday night. The winner was Elaine P. and she will be receiving a $20 gift card to Starbucks and a Java Jacket in the mail this week! I can’t wait to do another giveaway soon! 1. I love this idea if you had gates, a fence or even a deck railing. It’s very Hitchcock-ish and also super creepy…. you can find these fake crows online with wires already attached for securing or get them at the Dollar Store and secure them with zip ties and duct tape! 2. You can buy a straw mat and paint anything on it (use the tutorial from this post) and then get lots of rubber snakes underneath it sticking out from all angles, would be a unique thing for trick-or-treaters to see when they come up to your front door! 3. Such a cool way to line a walk-way or a garden bed… carve tiny pumpkins and then use wire hangers to hang them from lantern hooks! If you used flameless LED candles with a remote you could easily turn these on and off each night and not have to worry about open flames! 4. I think these are so adorable! Use white pumpkins and decorate them like owls using sunflower seeds, feathers and nuts! 5. Find a curved gourd and carve out a small hole, insert a glass into the hole and fill it with flowers… makes a super easy and AWESOME looking hanging vase! 6. Taking more muted colored pumpkins and spelling out fall on them using vintage keys is a really unique way to jazz up a front stoop! 1. Though I’m not a fan of the railing in the picture, I LOVE the skeletal prints hanging from simple bars on the wall. Would be a super simple DIY, just print out different black and white sketches and hang from a curtain rod or one of these wire hangers from Ikea! 2. I love the lighting in this room and think if you cut bird silhouettes out of black card stock and hung them on the walls and ceiling, this could be a great DIY room! 3. Taking foam mannequin heads, draping them with cheesecloth and then hanging them in groups creates a cool and creepy vibe in any room! 4. Take a vase and spray paint it black and then fill with white roses. Add some plastic spiders and snakes! 5. You could DIY these tables using mannequin legs and cheap sheets of metal from home improvement stores! 6. Getting a bunch of creepy crawly insects encased in lucite and scattering them all over the room would be a great talking point! 1. 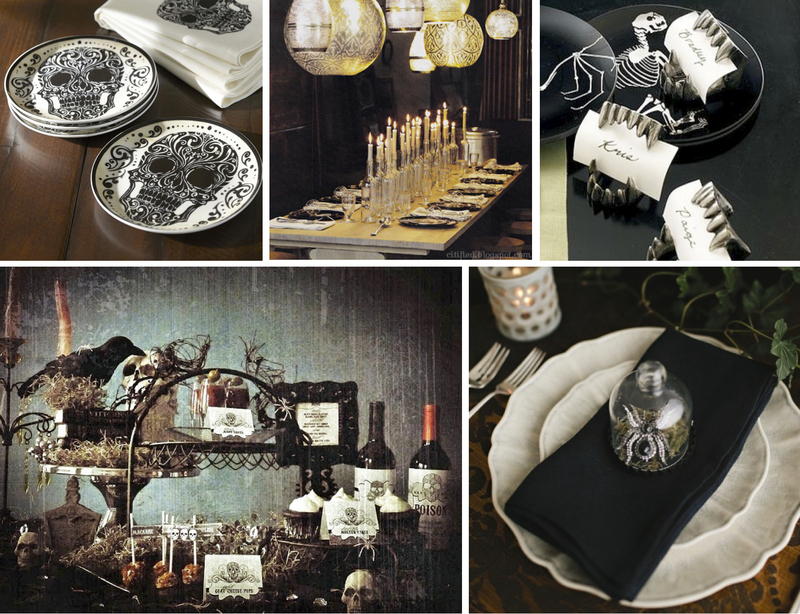 I think these Day of the Dead plates from Pottery Barn are super chic and cool and they’d be PERFECT for a halloween soiree! 2. This would be so easy to do but makes a BIG statement! Hobby Lobby had hundreds of cheap bottle options and you can get taper candles in bulk for cheap! Line your table and you’re all set! 3. The particular silver vampire teeth place card holders were from Pottery Barn a few years ago but you could EASILY do these yourself! Buy the plastic ones from Party City and paint with metallic silver paint! 4. There are SO many different options for printable labels for bottles that you can get a really cohesive look for your food and drink tables. This Etsy shop has the ones shown in the picture available for purchase. 5. I think these place settings are AMAZING! Using the black napkins with some moss and a spider inside tiny cloches?! It’s genius! 1. Roast chunks of fresh pumpkin, then wrap in bacon and sear them off… serve them on washed twigs and you have a delicious appetizer! 2. Make a cheese board with a slice of honeycomb and then swarm it with plastic bees… use wire to give the illusion of some hovering! 3. This cocktail mixes club soda, chambord, cran juice and blavod (a black vodka) to make a creepy and delicious drink! 4. These smokey sweet ribs, cut up and arranged like a rib cage is a fun way to serve a main dish… get the recipe here. 5. Fried chicken wings with a chinese black bean sauce arranged like bat wings… get the recipe here. 6. Cupcakes with sugar glass shards and blood icing… get the recipe here. Congratulations on your two year blogiversary, Danielle!! 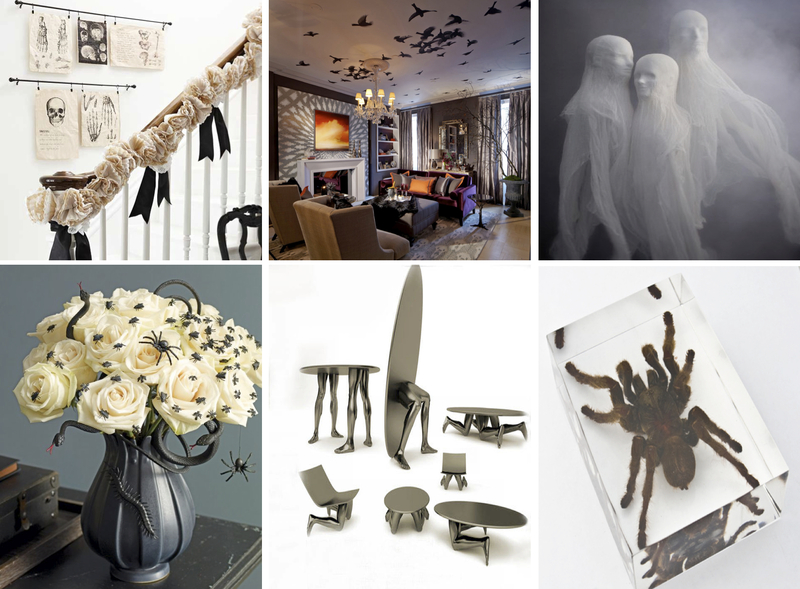 Great Halloween decorating roundup – thanks for linking to me! Thank you! I am obsessed with the table settings and all the pics from that party! Thanks so much! I LOVE that burlap wreath on your blog! 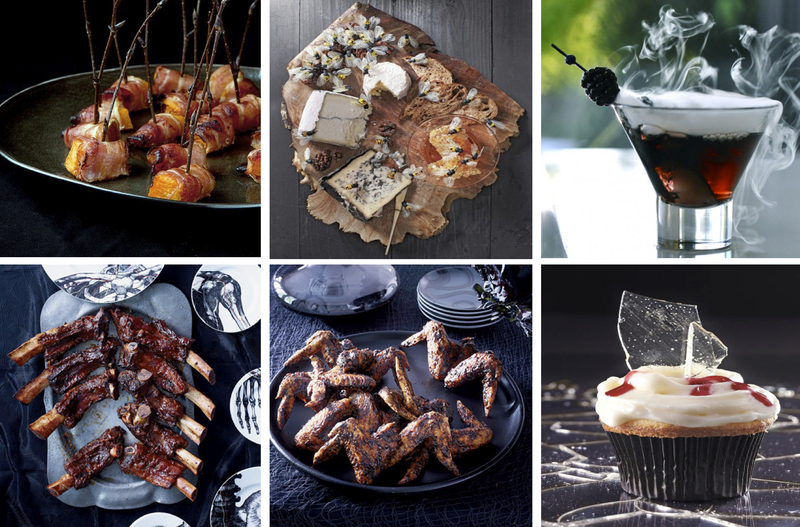 Love these Halloween ideas, so cute! LOVE these ideas!!! Thank you for being so inspiring! You’re so welcome! Happy you found some inspiration you liked here!